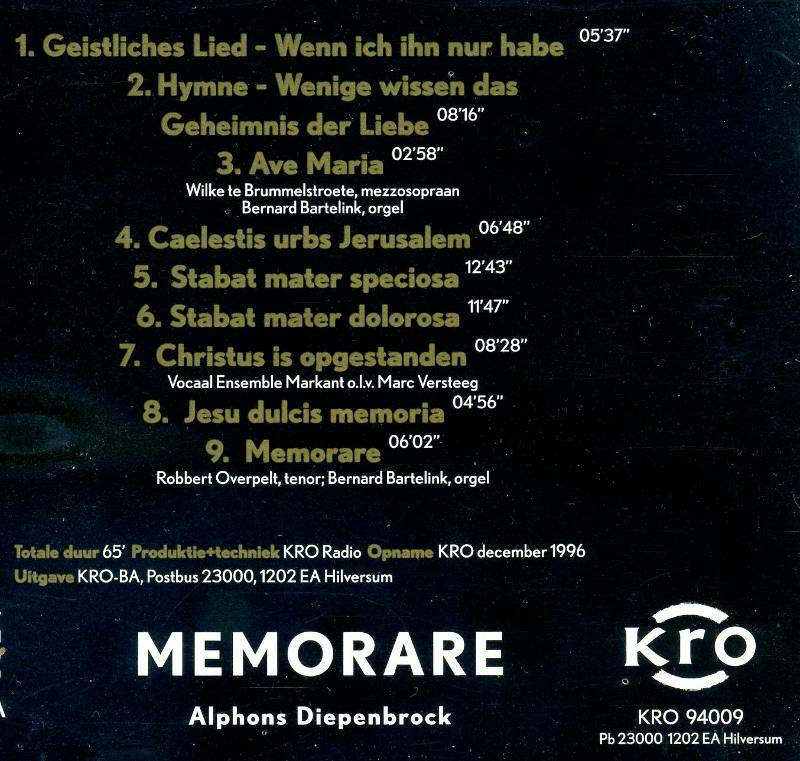 Jesu dulcis memoria is the second work by Diepenbrock that was inspired by La faute de l’abbé Mouret (Abbé Mouret’s Transgression) by Émile Zola (see Ave Maria, RC 23). 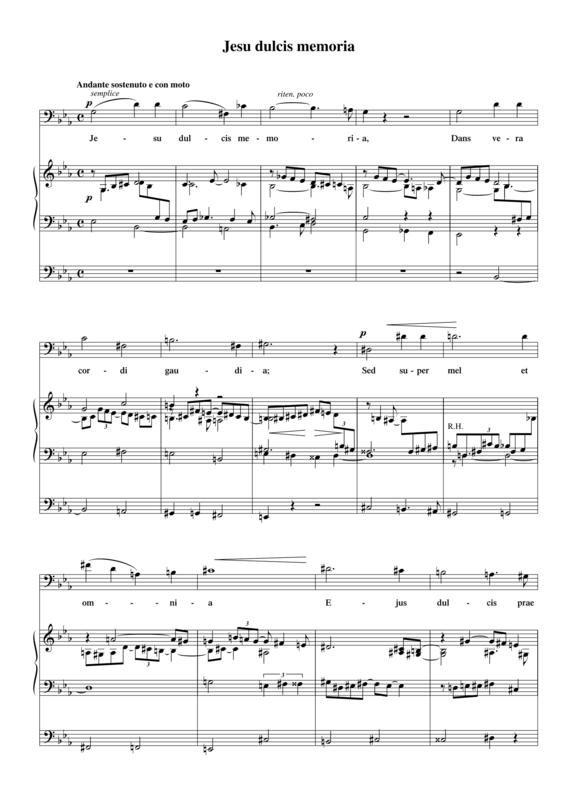 He uses the five strophes of the hymn of Bernardus of Clairvaux,1 which in the Roman Catholic liturgy are prescribed for the vespers of the Feast of the Holy Name.2 Remarkably, in Diepenbrock’s setting the third and fourth strophes have been changed round. The exact reason for this is not clarified in his letters, but a possible explanation could be that he was aiming for a particular climax. Diepenbrock’s word setting is syllabic and he emphasises the form of the poem by changing key with every strophe. The work is meditative and sedate right until the text “Jesu spes paenitentibus” at the beginning of the fourth strophe, where he repeats the melody of the opening line “Jesu dulcis memoria”. The fifth strophe is preceded by an eight-measure organ intermezzo with a gradual accelerando and leads to an ecstatic conclusion. In February 1896 Diepenbrock revised the work, replacing the organ part by piano accompaniment. Diepenbrock made a new manuscript of this version, A-41(2). The original autograph with organ accompaniment, which was most likely given to P. van Erven Dorens as a present, has been lost. A version for organ – possibly an arrangement of the manuscript A-41(2) – has been transmitted in semi-autograph A-80(9) from the collection of Gerard Zalsman. He performed the sacred song several times, for example with the organist Willem Petri (1865-1950) in the St Peter’s Church in Utrecht on 19 November 1907. The meticulous notation of the organ registration and the many tempo and dynamic markings in this manuscript (some are in Diepenbrock’s handwriting) make it an important document on the performance practice of those days. Jesu dulcis memoria was not published during Diepenbrock’s lifetime. The work was not included in Noske’s selection for his series of 1905, presumably for the same reasons as the Ave Maria (see RC 23). 1 cf. Heinrich Lausberg Der Hymnus ‘Jesu dulcis memoria’ = Hymnologische und hagiographische Studien Vol. 1 (Munich: Hueber 1967). 2 Raccolta di orazioni e pie opere, per le quali sono state concesse dai Sommi Pontefici le SS. Indulgenze (Rome: Perego-Salvioni 1855). Dan Jezus, ’s Vaders Een’ge Zoon. Wat Jezus te beminnen is. Hoe liefd’rijk wien verlangen U! Hoe goed voor al wie zoeken U! Maar wat voor hen, die vinden U? sweet Jesus’ love to know. 27 nov 1904: Uitvoering van Jesu dulcis memoria in de Luthersche Kerk te Leiden door Gerard Zalsman met orgelbegeleiding van Cornelis de Wolf, tijdens een kerkconcert van de afd. Leiden der Maatschappij tot bevordering der Toonkunst. Zalsman overtrof zich-zelven in een aria van Bach, den Hymnus (woorden van Hugo Salus; waarom dit niet op het programma vermeld?) van Smulders, en een diepzinnig (naar ik vermoed niet gepubliceerd) Jesu dulcis memoria van Diepenbrock. Ik herinner mij niet hem ooit zoo goed gehoord te hebben.